This article describes the types of trees, shrubs, or similar plants that should or should not be planted over or near septic fields or other septic system components. Planting trees, shrubs, and even some ground covers over septic system components are causes of septic system failure in the drain field, leach field, seepage bed, or similar components. Watch out: While not all sewage or septic system effluents will always make nearby fruits or vegetables unsafe, in at least some conditions planting fruit trees, or vegetables (or anything else edible) over the septic drainfield might produce food that is unsafe to either because watering or rain splash-up sends sewage-contaminated water droplets onto the surface of the edible fruits or vegetables OR because in some cases pathogens may enter the plant system by means of its roots. Wee SEWAGE CONTAMINANTS in FRUIT / VEGETABLES for details. This is the only sort of tree that we suggest can be placed over septic system components with little risk of damage. 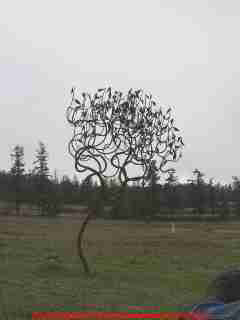 This is actually a metal sculpture. Even the placement of this "tree" could have damaged a septic field if during its installation heavy equipment was used to deliver the tree to this spot. Real trees will damage septic components by root movement or clogging. If you have a shrub for which you have reliable knowledge about the maximum extent its roots will normally reach, you might think it’d be ok to plant it exactly that distance from the nearest drainfield trench. Watch out: the extra levels of nutrients delivered to the soils by the drainfield may attract roots from nearby trees or shrubs and cause them to travel farther than usual. OPINION: keep shrubs with a “known” root travel distance 25% farther than that distance from the edge of a drainfield. In this photo the light and excavated area is where the new home owner saw and dug into a smelly wet spot that appeared in the yard the morning after moving into their new home - a house built 30 years before and one which employed a home made septic tank. While there were tree roots in the drainfield pipes of the system, the septic tank itself, which was too small, never pumped, and fully blocked, was the "root" cause of system failure in this case. (Pardon the pun). How much distance is needed between trees and septic drainfields? Whether you are planting trees or planning a new septic drainfield, keep the drainfield or septic leach field away from trees or shrubs which are likely to put down deep or aggressive roots. The roots will quickly invade and clog the buried effluent lines and may also cause them to move, break, or become disconnected. The actual tree to septic distance needed depends on the tree variety and its normal root growth range. Keep at least as much distance between the tree and the nearest drainfield component as the anticipated height of the tree at its maturity. So if the tree will be 30' tall at maturity keep it at least 30' from the drainfield. Some trees should be kept at much greater distances, up to 100' from septic fields, as we discuss just below. What kinds of trees should be kept farthest away from septic systems? Bamboo, Beech trees Fagus sp. and Birch trees Betula sp. Pine trees, such as Monterey pine. The pines in our photo (above-left) are white pines approximately 30 years old. Willow trees Salix sp are popularly known for "liking water" and will certainly send out long root systems. Kahn, Allen, Jones (book cited at Septic Systems Home-References) point out that certain of these trees such as bamboo, weeping willows, eucalyptus, cypress, Monterey pine, pepper, and walnut have particularly aggressive and deep roots. Keep such trees at least 100 feet from the nearest septic field component. Can I Plant Non-aggressive Rooting Trees near Septic Drainfields? 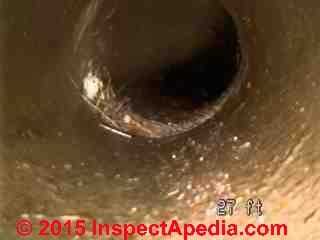 Above: the video camera line inspection shows a modest dislocation in a sewer line pipe joint through which roots are growing. Even a small root intrusion or pipe joint dislocation can accumulate or block the flow of solid waste leading to slow gurgling drains and ultimately to a complete drain blockage. Our photos above show root invasion at 27 feet and at 83 feet in this buried sewer line in Seattle, WA. Ornamental trees such as Cherry, Crabapple trees, and Dogwood trees. Some Pine trees (but not the Monterey pine) and Sourwoods. OPINION-DF: Some authors accept the near-septic use of these less aggressive trees with the advice that "... their damage is likely to be less severe". This seems silly to me. Any root clogging of septic systems is likely to be costly and inconvenient. But I’d be careful: the extra levels of nutrients delivered to the soils by the drainfield may attract roots from nearby trees or shrubs and cause them to travel farther than usual. OPINION-DF: I’d keep shrubs with a “known” root travel distance at least 25% farther than that "known root travel distance" from the edge of a drainfield. Some experts (Kahn, Allen, Jones) also point out that if you're planting on the edges and lower toe of a septic mound, those plants need to be able to tolerate the higher moisture levels found in those parts of the mound system. 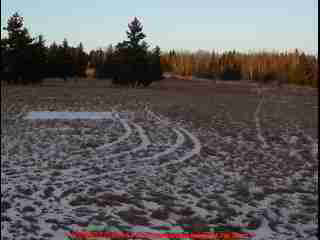 In the photo at the top of this page, our field in northern Minnesota provided ample room to place septic system components more than 100 feet from the nearest tree. But what about those tire track that show up in light snow? Driving over the drainfield can also damage it. The following table of native (to New Zealand) or introduced species of shrubs and trees lists species that are considered suitable for planting over an evapo-transpiration system and should be acceptable over a mound system or conventional drainfield as well. Note that other native species local to your area might also be suitable. Separately at Grasses or Flowers we provide a similar table of suitable grasses. Also see GRASSES or FLOWERS ok to plant over septic systems and drainfields or soakaway beds. Neem trees 50 feet or more; deep tap root. Witch Hazel Hamamelis virginiana 25-30 feet; some are surface rooting but can spread 20+ feet. Hamamelidaceae. How far from a drain-field should I plant a Honey-Crisp apple tree? Continue reading at ROOT KILLERS in SEWER LINES or SEPTIC PIPES or select a topic from closely-related articles below, or see our complete INDEX to RELATED ARTICLES below. 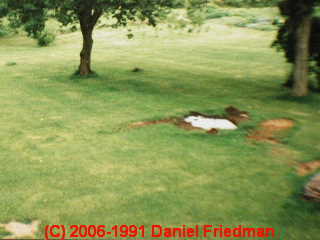 TREES or SHRUBS OVER THE SEPTIC FIELD or TANK at InspectApedia.com - online encyclopedia of building & environmental inspection, testing, diagnosis, repair, & problem prevention advice.